The fresh, acidic taste of our new season Bramley apples combines well with sweet, juicy blackberries. Here the fruit is topped with streusel (German for sprinkle), which is a mixture similar to a crumble, but lighter and crunchier, with patches of fruit peeping through. Preheat the oven to 190°C, gas mark 5. 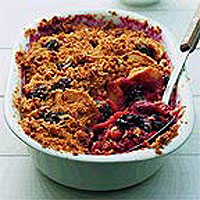 Toss the apples and blackberries in the sugar and tip into a buttered, shallow, ovenproof dish, about 1.5 litre capacity. To make the topping, place the flour and cinnamon into a bowl or a food processor. Cut the butter into small pieces and add to the flour. Then either rub in lightly and quickly by hand or work lightly in the processor until the mixture resembles rough crumbs. Stir in the sugar and nuts and sprinkle over the fruit, allowing patches to peep through. Bake for 35-40 minutes, until the fruit is tender and the topping is crunchy and lightly browned. Check the pudding after 20 minutes and, if it starts to brown too much, cover the top with foil. Test to see if the fruit is cooked and tender by piercing it through the topping with a skewer. Serve warm with custard or pouring cream. If you have warm hands it will be easier to make the streusel in a food processor as the mixture is fairly buttery. Vary the fruits according to the season. The apples can be replaced with stoned and sliced plums, and instead of blackberries try raspberries or even frozen fruits of the forest.